PhotoFunia is an online editing application that can instantly transform your photos from their original “boring” state into fun works of art that will amuse you and your friends. The only thing you need to do is to upload images to PhotoFunia, and it will automatically identify features on the image (such as faces or bodies) and apply various effects on top of them. You are never manually cutting layers from the image, because PhotoFunia does that work for you! Free online photo effects and filters! With few clicks you can transform image of your friend, and make it look like he is on vacation in Paris, or morph him into Mona Lisa or bodybuilder. 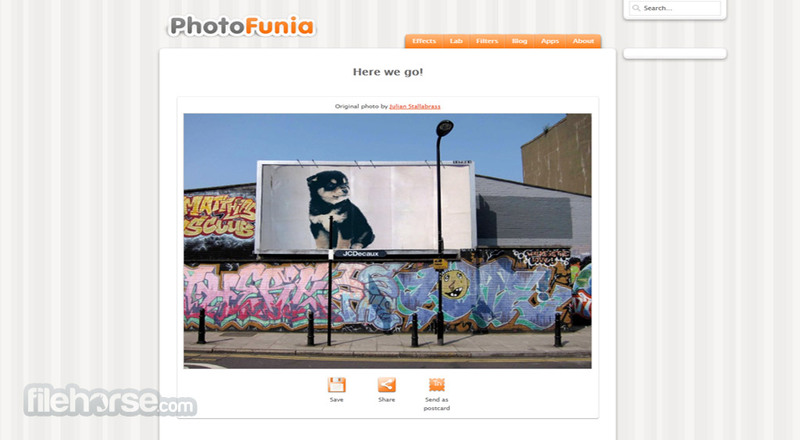 With PhotoFunia you have over 150 scenes and effects to play with, ensuring that you will always have fun and never get bored. 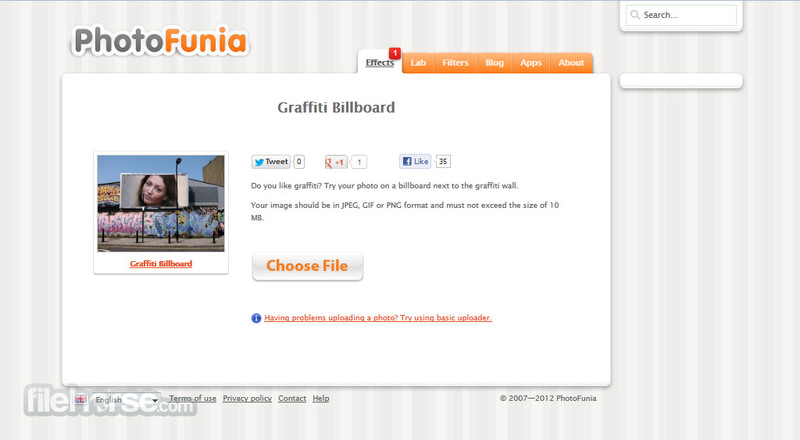 Photofunia is an easy to use image editing web application that enables anyone to easily transform their ordinary photos into eye-catching and attractive images that are perfect for sharing online among friends, family members and public posting of forum boards, blogs, websites and social network platforms. 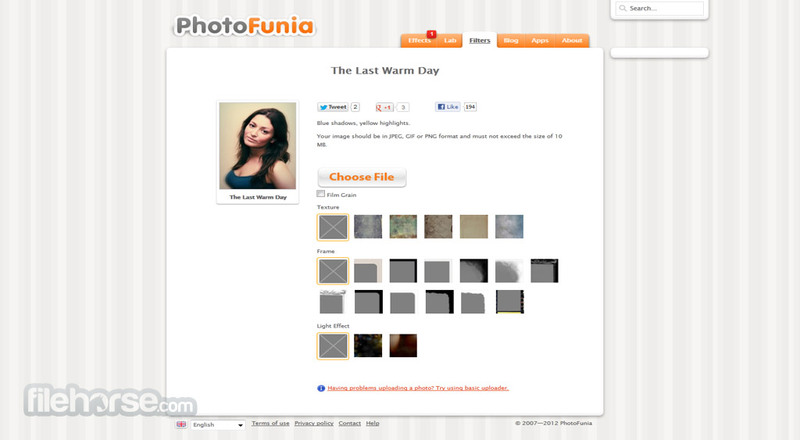 While many other image editors that are oriented on enhancing photos with fun effects have complicated procedures and dashboards with many tools, Photofunia has oriented its interface and tools toward providing extremely easy experience to novices, who just want to pick image-transforming effect, chose upload their own photo and then in seconds receive finished image that they can use and share however they want. Free online photo effects and filters! Photofunia users can not only apply Instagram-like full screen effects that can make your photo for example look vintage, but you can also incorporate your pictures into hundreds of frames. This way you can take your face (or image or your friend, family member, colleague, celebrity…) and place it on posters, ornaments, billboards, bodiesof other people, calendars, and more. All effects are aiming to provide you with interesting pictures. Free online photo effects and filters! The process of creating new images is easy. Pick any of the effect showcased on main page (listing of most popular effects, category filtering, search bar for manual searching), click on that effect, choose one or more images (upload from computer, URL, social network), text overlay and click on a button “Go”.Final images can be saved as full images, 100x100 avatars, sent as postcards via email, or directly shared to Facebook, VK, Mail.Ru and Odnoklassniki.